Published on October 17, 2013,	by Tina O'Connor in A Thought on Positive Thinking, Be That Girl, Be That Mom, Get what you want., Release Your Inner Girl, Uncategorized. Published on October 9, 2013,	by Tina O'Connor in Be That Girl, Be That Mom, Get what you want., On being Tina., Release Your Inner Girl, Uncategorized. Look out Ottawa, Toronto, and Winnipeg! Tina O’Connor is coming to town! 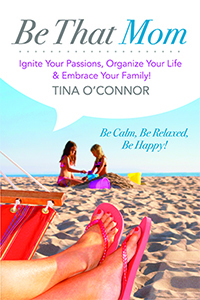 Published on September 25, 2013,	by Tina O'Connor in Be That Girl, Be That Mom, On being Tina., Release Your Inner Girl. Published on September 18, 2013,	by Tina O'Connor in A Thought on Positive Thinking, Be That Girl, Be That Mom, Get what you want., Stress, Uncategorized. Back To School, Lunches and A #Giveaway ! Published on September 11, 2013,	by Tina O'Connor in Be Organized, Be That Girl, Be That Mom, Uncategorized. Get Your Green Thumb Happy & Reap What You Sow! Published on August 30, 2013,	by Tina O'Connor in Be That Girl, Be That Mom, Get what you want., Healthy Living, Uncategorized. Recipe for a Great Girls Night Out! 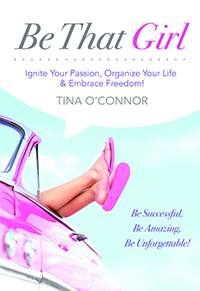 Published on August 27, 2013,	by Tina O'Connor in Be That Girl, Release Your Inner Girl, Uncategorized. Published on August 20, 2013,	by Tina O'Connor in Being Organized, Get what you want., On being Tina..
Keeping Organized is a Team Effort! Published on August 14, 2013,	by Tina O'Connor in Be Organized, Tips of Feng Shui.. I love an organized house, closet, pantry… you name it! Nothing makes me ooh and ahh more. Of course, even I have those moments where life gets too hectic, and the paper piles on the counter and the closet loses its mind. 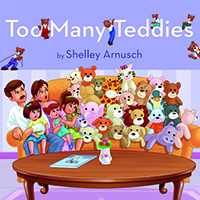 A family of five can get disorganized in the blink of an eye!